There were early signs — from a young age — that I was going to be a voice-over geek. When most kids were lip-synching into a hairbrush to songs in their bedroom, I, too, was using my brush as a mic — to practice long-form documentary narration. As the closing credits for episodes of The Electric Company scrolled by — the cue for most kids to scramble to the kitchen to find something sugary — I hung around, and read aloud to the sponsorship credits, which went something like: “Funding for the Electric Company is made possible by a grant from the Corporation for Public Broadcasting and the Ford Foundation, and by a grant from the Carnegie Corporation of New York …” I considered it a personal feat to match the pitch, rhythm and the cadence of the announcer — and *then* went to find something sugary. I also had an early fascination with telephone voices, which led to me calling the “Time and Temperature Lady” several times a day. It didn’t even occur to me that what she did could be a viable career — I just loved the idea of someone keeping an eye on the time for me, and cheerfully telling me exactly what that time it was, no matter when, or how often I called in. She’s called Neiti Aika in Finland; Fröken Tid in Sweden, and Froken Ur in Norway (literally: “Miss Time”) Horologe Parlante in France; Zeitansage in Germany, Klukkan in Iceland, Tante Cor (“Aunt Cor”) in the Netherlands, and Zegarynka in Poland. The need for an automated “timepiece” — who also sometimes dispensed current weather updates — knew no international boundaries, and filled a critical requirement for (by that time’s standards) instant and up-to-date information. 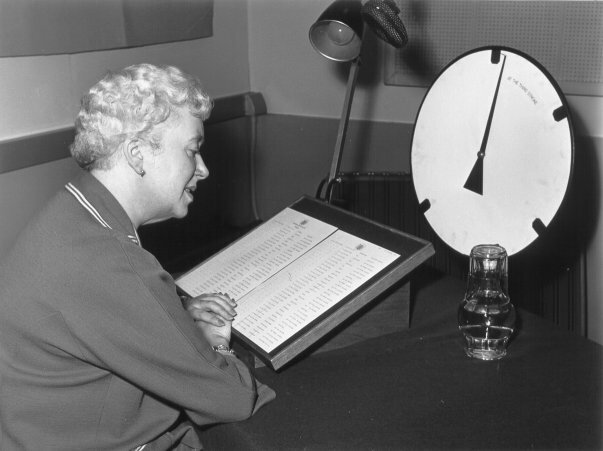 Early speaking clocks used rotating glass discs on which different “parts of time” were recorded on the disc. A synchronous motor drove the disc with a power source derived from a 5 mhz quartz oscillator. An actual hand wheel was used to spin the motor on start-up. This was pretty much the status quo until digital systems became prevalent in the early 80’s. They used a built-in crystal oscillator and microprocessor logic control, with solid-state microchips — and no moving parts at all; thought be accurate to five thousandths of second. The early time/temperature companies in the US — the first being Audichron; the second being a close competitor, Weatherchron, were known to prefix the time/weather postings with plugs for the phone companies who incorporated them into their systems — one could hear messages such as “A long-distance call is a smiling happy way to visit. Ohio Bell time is…” or “Give people a chance to answer; let the phone ring ten times..” Many of the early prompts were voiced by the legendary Jane Barbe (whom I’ve written about previously in the blog: http://bit.ly/edizit) as well as John Doyle and Joanne Daniels. With the prevalence of computers, initially, and now the hand-held devices which are a permanent part of our lives (and which give us instant, real-time access to critical information), the need to go through “complicated” measures (such as dialing a phone) just to access the accurate time or the latest ever-changing incarnation of the weather forecast, is yet another aspect of telephony I seem to be blogging more and more about — an aspect which is going the way of the dinosaur. 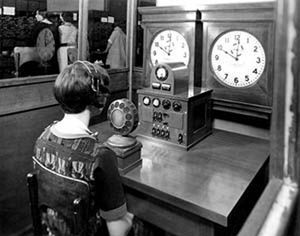 Give the Brits credit for being old-school — to this day, the BT Speaking Clock receives around 60 million calls a year. The US seems to be slightly less sentimental: in September 2007, AT & T discontinued its California service, and droves of states in the US followed suit: the time/temperature services have been phased out as a telephone company adjunct product in every state but Nevada — national time recordings are still available, provided by shortwave radio time signals WWV and WWVH, and in addition, the United States Naval Observatory operates two speaking clocks, in Washington DC, and in Colorado Springs, CO — as well as Microsoft TellMe providing a voice portal designed to dispense time/temp data. In Canada, The National Research Council still maintains a telephone portal to dispense info from their primary cesium atomic clock — but only gives readings for the Ottawa/Gatineau area. Our need to know — our compulsion to stay connected, up-to-date, and current — has only blossomed over time and with every device we incorporate into our lives which trump the last one in its edginess and innovation. I still calibrate my wristwatch every morning with an excruciatingly exact online clock; my urge to study upcoming weather patterns has done anything but abated. I just no longer have access to a cheery “person” re-setting and re-positioning me in the time continuum — another quaint hallmark of telephony which has sadly atrophied and become obsolete. Next blog, I’ll be writing about the famous “Voices Behind the Consoles” — in TV and Movies, there’s occasionally an unseen character, made all the more compelling by the fact that they *are* just a voice….thanks for reading! Your comments are always welcome! No acrobatics necessary -- find your toy whistle instead! Phreaking is a slang term — now a common part of technology nomenclature — which is used to describe the activity of a subculture of people who study, experiment with, or explore (and yes, exploit) telecommunications equipment and public telephone networks. With the computerization of telephone networks, Phone Phreaking has become inseparably linked with computer hacking — often referred to as H/P Culture, or (hacking/phreaking). While the ultimate goal in phreaking eventually turned out to be — let’s just say it — toll fraud, by way of “tripping” or “tricking” a telephony network into providing free long-distance and international calls or to tap phone lines, it should be noted that the early phone phreaks were motivated by learning about the telephone network and how it operated. In his Phone Phreak blog historyofphonephreaking.org, Phil Lapsley admits that phone phreaks pointed out to him: “We didn’t have anyone to call”. Lapsley further explains: “Think about it: if you’re a typical teenage kid in the late 1950’s or early 1960’s, it;s not like you have a far-flung network of long-distance buddies to call.” While free calling is a tangible “payoff”, it becomes evident — the more research one does into the topic — that the mere “sport” of Phreaking; the actual execution of new and intriguing ways of manipulating a system — and the acclaim and notoriety which goes along with it — is actual, calculable reward in and of itself. While the exact origins of phone phreaking are a little hazy, it is believed that phreak-like experimentation began with the widespread deployment of automatic switches on telephone networks — namely with AT & T, which began introducing automatic switches for long distance and some trunking carriers in the mid-to-late 1950’s. The automatic switches used tone dialing, a form of in-band signaling, and included some tones which were strictly and exclusively for internal telephone company use. When it was understood — among the growing community of those wishing to hack into public telephone networks — that the frequency for internal use was precisely 2600 Hz, automatic switches became vulnerable and ripe for attack. That discovery — of that perfect frequency — came about accidentally in 1957 by a blind seven year old boy named Joe Engressia, who was blessed with perfect pitch, and who discovered, quite by chance, that by whistling the fourth E above middle C (a frequency of 2600 Hz), he could stop a dialed phone recording. (It bears noting that — apparently — a large percentage of early phone phreaks were blind or at least, sight-impaired — although with the cloaked nature of their identities, the actual number is unknown.) Engressia — unaware of what he had done — called the phone company and asked why the recordings had stopped. Unable to furnish him with an answer, the phone company likely didn’t give his query much thought — until phreaking picked up momentum. A man code-named “Bill from New York” discovered that a recorder he owned could also play the 2600 Hz tone with the same effect, and an early phreaker named John Draper (whom I had the surreal experience of sitting next to at lunch during an Astricon convention) discovered through his friendship with Engressia that the free whistles given out in Cap’n Crunch cereal boxes also, coincidentally, emitted the 2600 Hz tone (earning him his now-legendary nickname “Captain Crunch”). The replication — or matching — of the 2600 Hz tone allowed control of SF (single frequency) phone systems, and it was further discovered that a long whistle would reset the line; followed by groups of whistles (a short tone for “1”, two for a “2” and so on.) Different specially-designed boxes — named different colors (and yet not necessarily painted those colors) were intended for various different phreak approaches: a “black box” would enable free calls made from any home phone, a “red box” for making free calls on any payphone, and the infamous “blue box” provided complete control of the telephone system. That was single frequency. 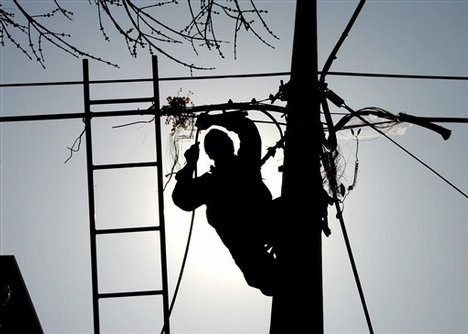 The most common signaling on long distance networks became multi-frequency controls. What those specific frequencies were, was unknown until 1964, until Bell Systems themselves, in essence, gave away the “keys to the kingdom” by publishing the information in a Bell Systems Technical Journal, describing the methods and frequencies used for inter-office signalling. The journal was intended for the company’s engineers; it soon made its way onto various college campuses and into the hands of those with a penchant for experimentation. In 1971, Esquire Magazine introduced phreaking to the masses with the article “Secrets of the Little Blue Box” — which made mention of soon-to-be-phreaks and future Apple founders Steve Wozniak and Steve Jobs. But it was the article which appeared in the June 1972 issue of Ramparts Magazine entitles “How to Build a ‘Phone Phreak’s”” Box” which touched off a firestorm of interest in phreaking — and even went so far as to include simple schematics of how to construct your own “black box” used to make and receive free long distance calls. There’s few things more satisfying than the fortresses of the giant telcos being circumnavigated; and there’s something intriguing about the resourcefulness, the hucksterism, and the full-out charlatanism required in order to use technology to stick it to “the man”. Next blog — in two week’s time — I’ll be writing about Speaking Clocks or “Time & Temperature”– the automated time-telling services which have been around practically since telephones were invented, and which are rapidly heading the way of the buggy whip.